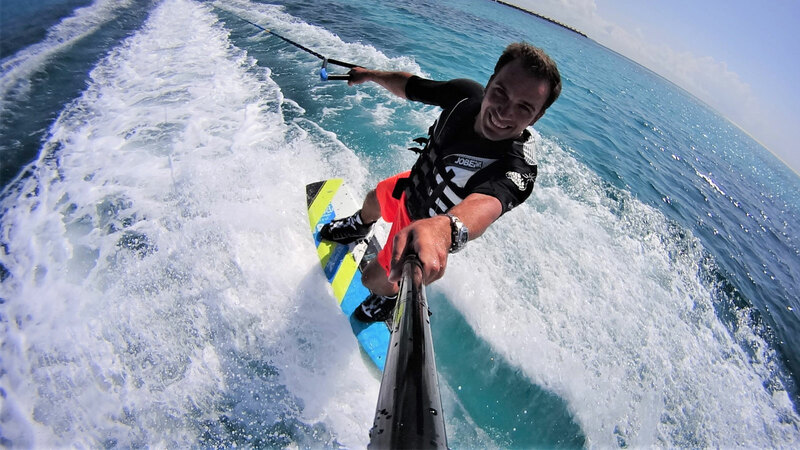 It’s time for wakeboarding and water skiing at Hurawalhi! Sunny greetings from Ocean Watersport Center at Hurawalhi Island Resort! We are being caressed by plenty of sun, the skies are blue and so is the sea – the shades of blue on display are simply spectacular and, much to our joy, the ocean is also as flat as the delicious pancakes from the live cooking stations at Canneli Restaurant. My team and myself, we are not huge fans of the freezing cold winter weather, but do enjoy skiing and snowboarding. Although there aren’t any big slopes to hit in the Maldives, luckily enough, that doesn’t mean we are missing out on the boarding and skiing fun – we just do it a bit differently, Maldives style! A speedboat, a long line and a pair of skis or a wakeboard is all we need. The good news is that Ocean Watersport features all of the above, so off the go! It’s a great feeling sliding over the water and trying new tricks – without freezing toes ruining the experience! Water skiing and wakeboarding are great fun that everyone can learn. The most tricky part is getting out of the water, but by taking a 25-minute beginner’s lesson, one gets explained the important steps in the shallow lagoon by one of our instructors, who then takes you out, a bit further away from the island, where you have all necessary space to give it a try. Once you master the first part, the riding is all about confidence, and we love to see how our students get braver and braver, jumping small wakes and enjoying their time to the full. Of course experienced water ski/wakeboard lovers are joining us too, appreciating the benefits of the warm Indian Ocean. If you are now argumenting that you would however miss the après-ski, fear not: barmen at Coco Bar are always at the ready to serve you your favourite drinks. With that being said, should you have not hit the slopes this winter, simply come and visit us here at Hurawalhi Island Resort – we’ll be more than happy to take you out for some skiing and boarding on the ocean.